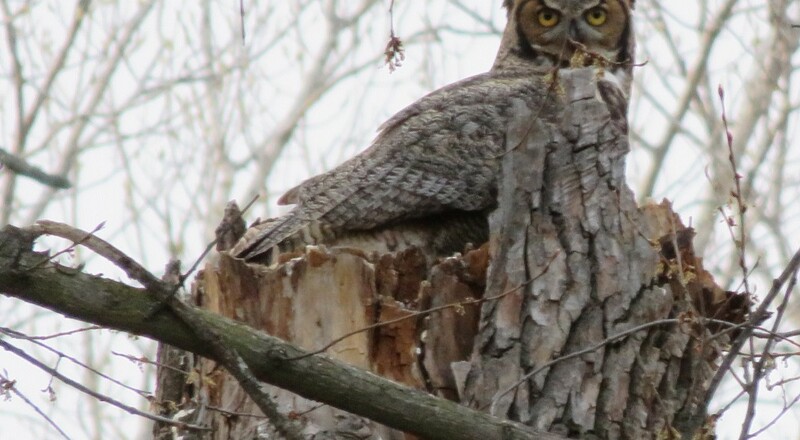 For years our family heard Great Horned Owls hooting in Crow Island Woods on winter nights. We’d stand on our balcony in the cold and dark hoping to catch a glimpse of these magnificent raptors. 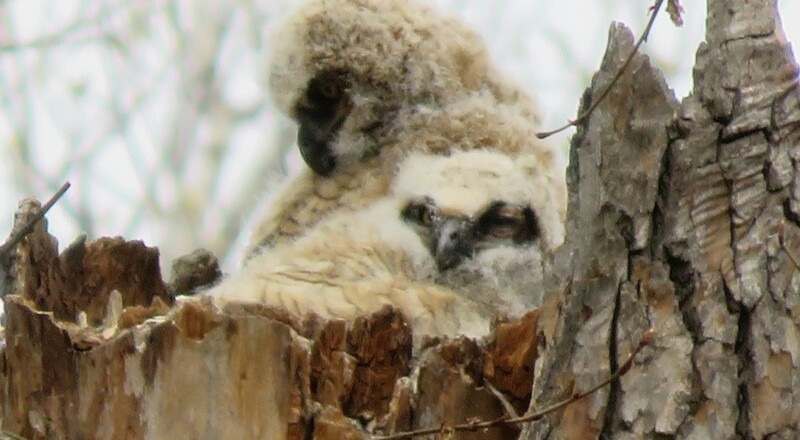 The owls eluded us until the spring of 2015 when we discovered a pair with two nestlings in Crow Island Woods just behind our house. I can’t describe how excited we were to finally see them. 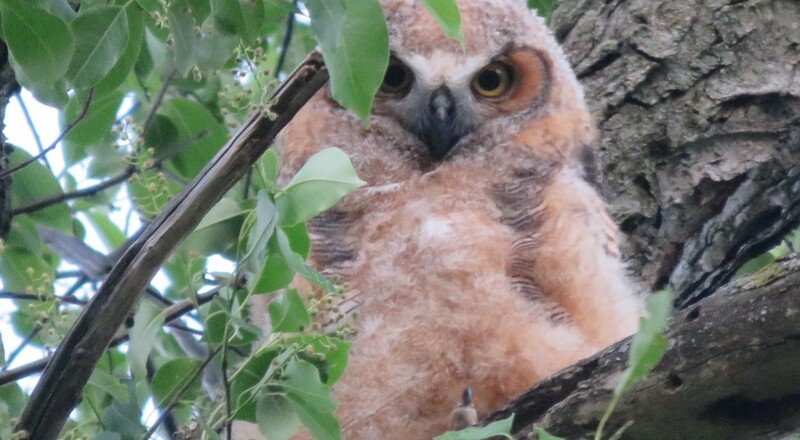 Previously, I wouldn’t have believed it possible to see a Great Horned Owl from your backyard let alone to see owlets grow, leave the nest and learn to fly! It was such a privilege to witness all that in our suburban neighborhood. This spring, the pair again nested in Crow Island Woods. 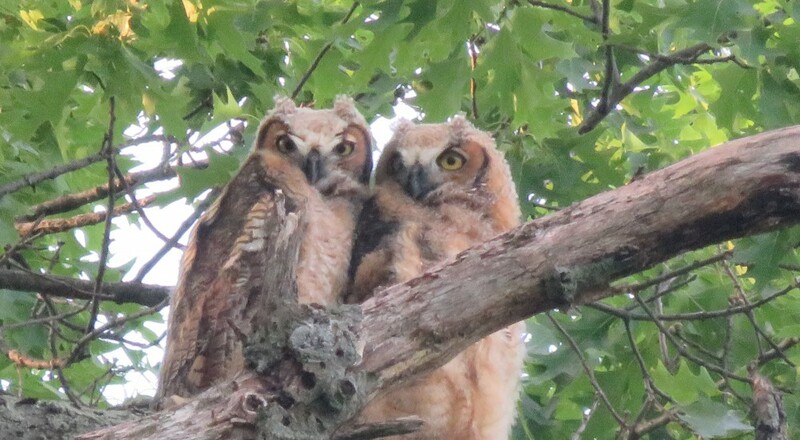 Since Great Horned Owls mate for life and may retain their territories for as long as eight years, we could have the pleasure of seeing this pair and their babies for several more years. The offspring, on the other hand, will only remain in Crow Island Woods till the fall. Juvenile owls will either voluntarily leave to settle their own territory or, in limited cases, the parents will drive them away. Visitors to Crow Island Woods have been respectful of the owls by observing unobtrusively and not disturbing them in any way. If this weren’t the case, the owls might decide to find a new territory or, a more devastating thought, someone might inadvertently draw a predator’s attention to an unattended nest. On a lighter note, since so many in the area are pet owners, Great Horned Owls are one more thing that dog and cat owners may disagree on! Dog owners have reason to want Great Horned Owls in their neighborhood since they are one of the few natural predators of skunks. Any creature that reduces the risk of having a skunked dog is nothing short of a superhero for dog owners. Cat owners likely feel differently since Great Horned Owls can and will prey on cats. Having a pair in your neighborhood is one more reason to keep your cats indoors.